Question 1: Which of the following figures lie on the same base and between the same parallels? In such a case, write the common base and the two parallels. 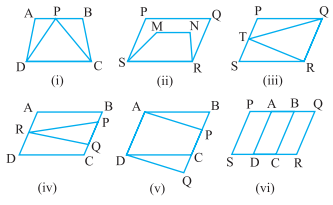 Question 1: In the given figure, ABCD is a parallelogram, AE perpendicular DC and CF perpendicular AD. If AB = 16 cm, AE = 8 cm and CF = 10 cm, find AD. Answer: The figure shows a parallelogram ABCD in which E, F, G and H are the mid-points of sides. AM is the height of parallelogram ABCD. 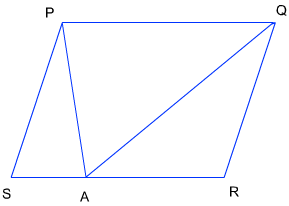 Altitude of ΔEFH is EO, and altitude of ΔFGH is GN. Question 3: P and Q are any two points lying on the sides DC and AD respectively of a parallelogram ABCD. Show that ar(APB) = ar(BQC). Answer: Let us assume that height for the base AB is h1 and height for the base BC is h2. Answer: Let us draw MN||AB passing through P. Let us assume that height of parallelogram ABNM is h1, that of MNCD is h2 and that of ABCD is h. The base for all parallelograms shall be equal to AB. Answer:We know that area of two parallelograms on the same base and between same height is equal. We also know that are of a triangle is half the area of parallelogram if they are on the same base and between same height. Question 6: A farmer was having a field in the form of a parallelogram PQRS. She took any point A on RS and joined it to points P and Q. In how many parts the field is divided? What are the shapes of these parts? The farmer wants to sow wheat and pulses in equal portions of the field separately. How should she do it? Answer: The following figure shows various parts in which the field has been divided. 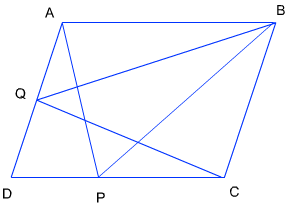 The field is divided into three parts. 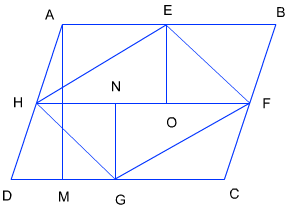 All parts are triangular in shape. 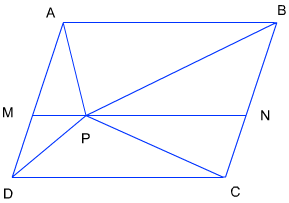 The farmer can sow wheat in triangle PQA and pulses in remaining triangles or vice-versa.